A Weekend in Wine Country: Finger Lakes, NY | Chip Chip Hooray! A phrase you’ve often heard to describe consumption of alcohol at an hour that might otherwise be considered uncouth, no? Well. Let me tell you, friends, there is something weirdly freeing about uttering those words at the blissful hour of 10 a.m. The weekend before Valentine’s Day, Charlie and I took a long weekend’s vacation in the Finger Lakes region of upstate New York. 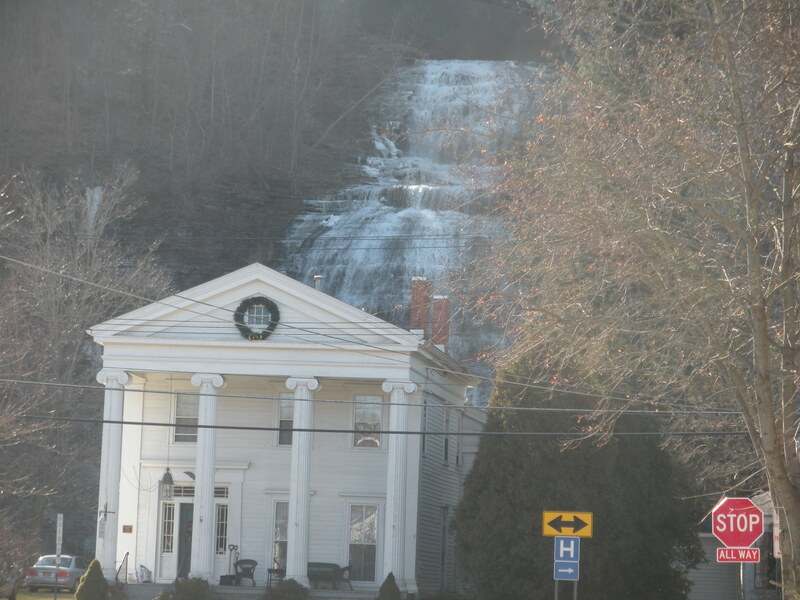 We stayed at a bed and breakfast called Rosemary’s Legacy in Montour Falls, about a five-minute drive from the banks of Seneca Lake. The owner, John, quickly became one of our favorite parts of Montour Falls (more about him later!). February is the off-season for the Finger Lakes, so there were a ton of amazing packages and deals to be had. One of them was the obviously enticing Wine and Chocolate Weekend–three days of wine tasting up and down Seneca Lake with a sometimes sweet, sometimes savory chocolate pairing at each participating winery. Un. Real. Seriously, how could we hear about this event and not do it?! As part of our Winter Wine Weekend stay at Rosemary’s Legacy (another off-season package! 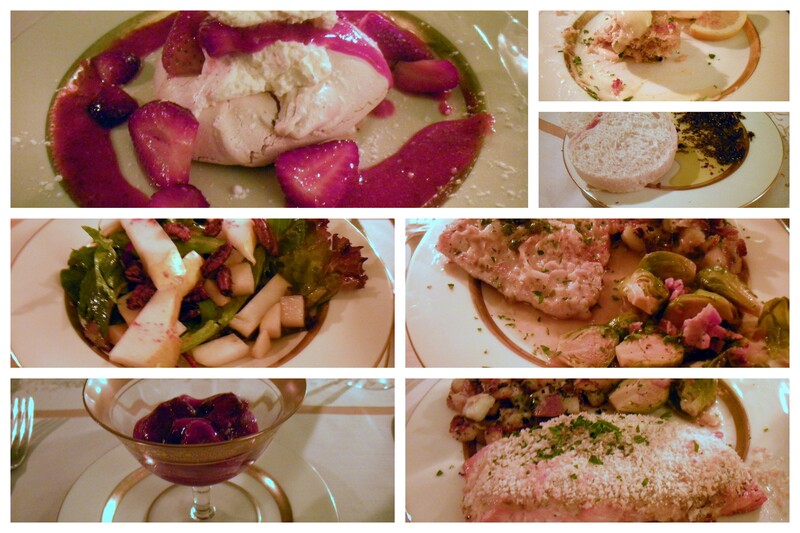 ), John cooked us a five-course dinner to pair with a bottle of the Finger Lakes wine we purchased during our tastings. 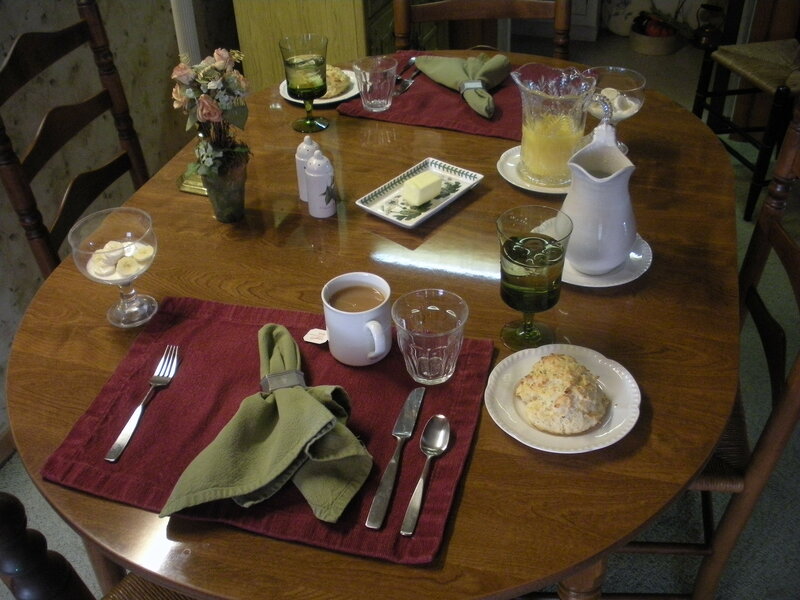 He and his wife, Maryalice, run a catering service called Table for Two in addition to their work at Rosemary’s Legacy, and they really have the intricacies of the in-home dining experience down pat! I could so get used to this. I’ve mentioned in the past that Charlie isn’t the world’s biggest breakfast fan, but even he said that if he woke up to meals like this on a regular basis, he’d become a breakfast convert in no time. Our first morning featured bananas and cream and a cheddar chive biscuit, followed by a fantastic and flavorful scrambled egg hash with ham and peppers. 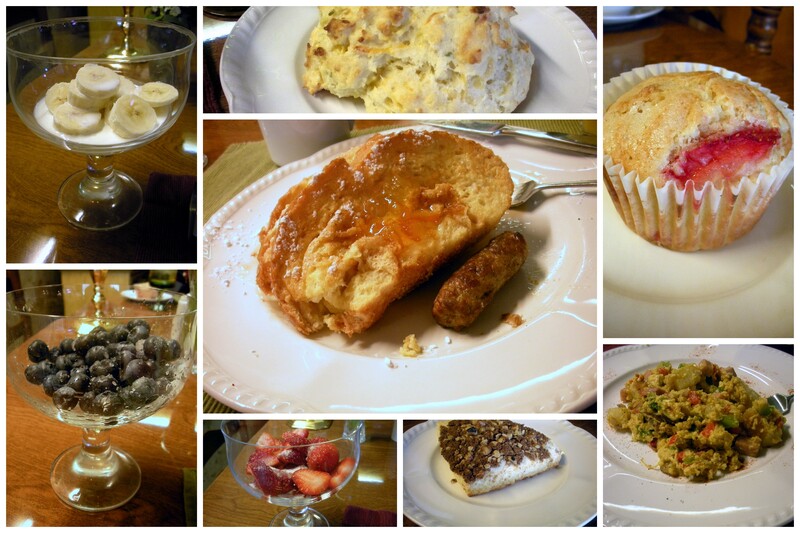 Day two aimed to please with strawberry muffins, fresh blueberries, and orange cream cheese stuffed French toast (with sausage!). Finally, day three stuffed us with brown sugar walnut scones, fresh strawberries, and Belgian waffles (not pictured because I inhaled mine before I remembered to take a photo. Oops again). We also had dinner at one of the wineries on the lake during our weekend stay. Red Newt Cellars has a bistro/restaurant attached to their tasting room, and their food came highly recommended by John. Our server was incredibly knowledgeable about their wines–he crafted a wine flight for each of us based on what we told him about our preferences and menu choices! 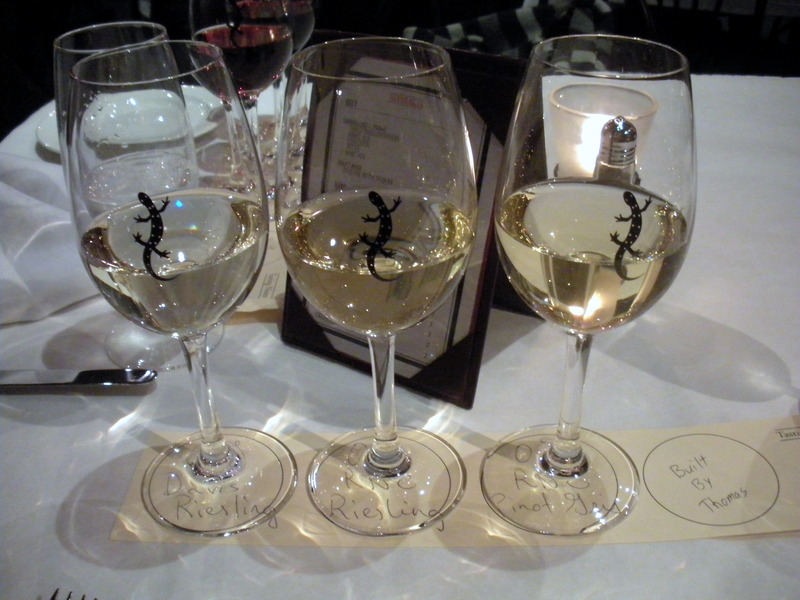 My wine flight included two Finger Lakes Rieslings (from ’09 and ’07) and a Pinot Gris. Our waiter specified which I should drink with my appetizer and entree, and his recommendations were spot on–Charlie was equally happy with his reds, although I’ll admit to not sampling any! I opted to start with the salon salad, which featured white beans, artichoke hearts, and quinoa…aka everything I love on greens. Charlie went for the chef’s special rye flour ravioli filled with a beet/ricotta/mascarpone mixture (I loved these–the filling was sweet, which was so unexpected and fun). The organic chicken breast I had was tasty, yes, but the real star was the bourbon risotto that accompanied it–I seriously could take a bath in that stuff. My beloved red-meat eater seemed to love his beef tenderloin as well. Do I ever not eat dessert? I was in an ice cream mood, so apple crumble spoke to me…although I couldn’t help sampling a bite of Charlie’s peanut butter and jelly cheesecake. So sue me. The view at the end of our street. For serious. 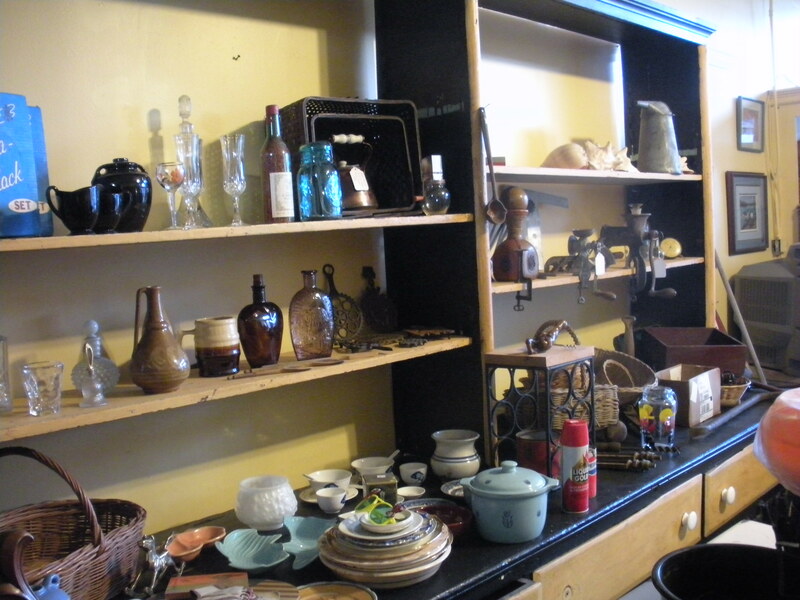 Antiquing! On Main Street in Montour Falls (walking distance from Rosemary’s Legacy). 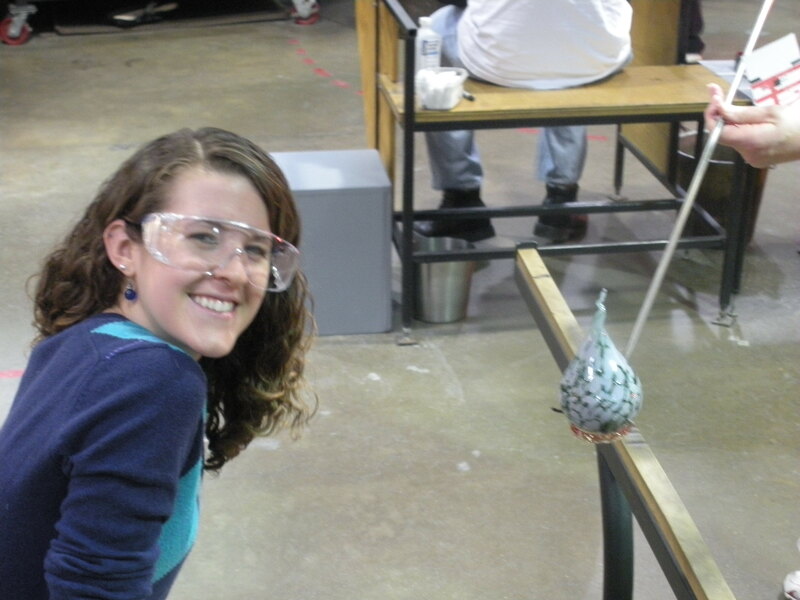 I made a blown-glass sculpture at the Corning Museum of Glass! As I mentioned above, the B&B owner, John, was an utter phenom. I don’t think we could have met anyone who knows more about what to do in the area, and it seemed like he knew somebody at every winery on both sides of the lake (we even met one of his former students at a tasting!). Upon our arrival, he provided us with a folder full of local eateries and sights, many of which were his and Maryalice’s favorites. He even texted us when we were out during the day to let us know about a live music event at one of the breweries later that evening! The love he puts into what he does is so clear and the homey space he creates (the house was his parents’) makes a weekend away feel like a stay with family. I wound up returning home with a bottle of Vidal Blanc from Atwater and one of Cayuga White from Hickory Hollow (this is to say nothing of Charlie’s case of wine). But I also learned so much more about my “wine palate”–and I found red wines I like! (I would always turn up my nose at those “earthy” reds.) Even with our purchases included, this weekend trip was ridiculously affordable–if you’re looking for a shorter getaway on a budget, I can’t recommend the Finger Lakes wine country highly enough!! This entry was posted in Vacations and tagged charlie, chocolate, vacation, valentines, wine by chipchiphooray. Bookmark the permalink. I was up there for the holiday wine tour on Seneca Lake and I have done the Finger Lakes Wine Festival at Watkins Glen Race Track for 7 years now. The Mardi Gras happenings looked interesting – some day! Wow, it sounds like you two had a blast in the Finger Lakes! I actually remember serving you at Atwater! It’s nice to see that your fun experiences continued all weekend. John and Rosemary’s Legacy sound wonderful. I will have to recommend this B&B to customers. Thanks for sharing about your great experiences, I hope this means we’ll see the two of you again in the area! You have a wonderful way with words and it will make many of us want to jump in the car and go get YOUR experience. Although I live in nearby Elmira (Mark Twain Country), you have given me some tips on some new things to try. 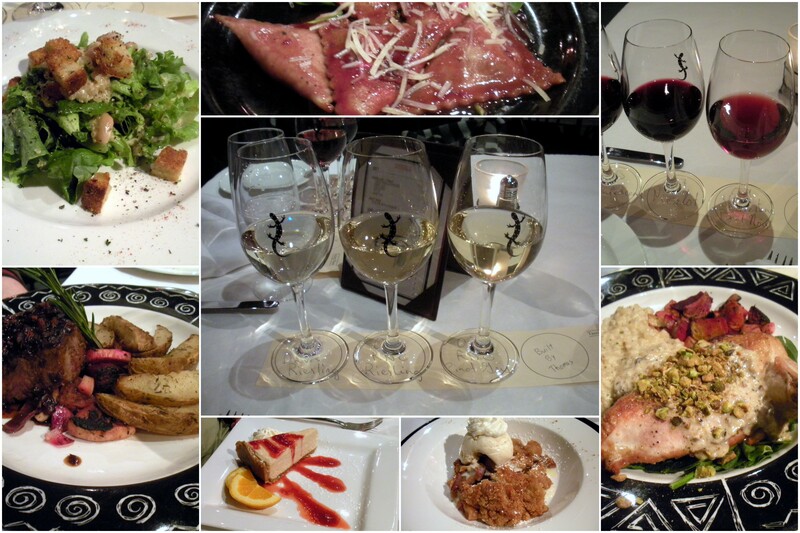 Thanks for sharing and I’m betting you’ll be back to visit Finger Lakes Wine Country again! Wow I wish I was into wine while I had lived in Rochester still. Looks like an amazing time! We did a Girl’s Getaway weekend at Rosemary’s Legacy a couple of winters ago, and also had an amazing time! John and Maryalice are the perfect hosts. Our girls weekend included massages, manicures, pedicures, etc. It was awesome! The food John made was divine! We live right here in the Finger Lakes, so this is the perfect getaway whether you are near or far. I love the finger lakes. My BF is originally from up there- spec from Skaneateles. 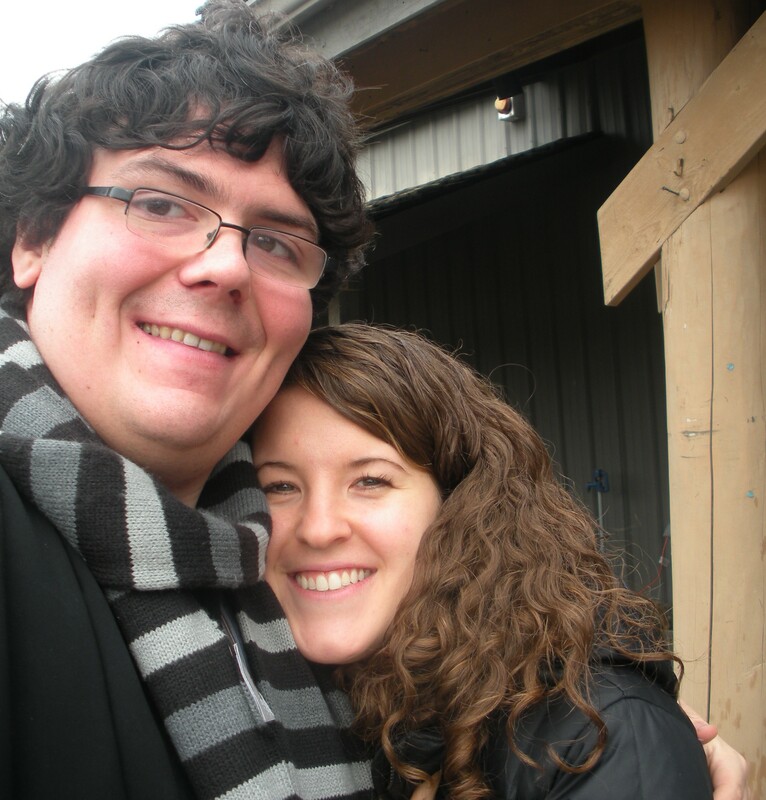 We love driving around Cayuga Lake and hitting up the wineries along there. Looks like a great time! I have always wanted to make my own glass stuff- looks fun! Well now I am pretty much sold! wow, looks like such a wonderful time + holy moly, all that food looks divine! by the way, is that your glass sculpture in the picture with you? if so, i’m super impressed – it looks wonderful! wow looks like an incredible weekend! Thanks for writing such a detailed post. I have been wanting to plan a wine trip to the fingerlakes. Now I have some great ideas of where to go!